1. Preheat the oven to 200ºC, gas mark 6. Line a large baking sheet with baking parchment and place the squash, pepper, olive oil, sage and seeds on the paper. Stir well together and spread them out in a single layer. Cook for 30–40 minutes, stirring once or twice until tender and lightly browned. 2. 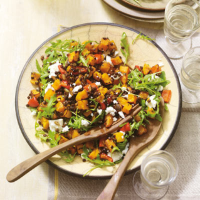 Tip the roasted squash into a serving bowl and stir in the lentils and vinegar. Leave to cool for 5 minutes. 3. Gently fold in the rocket and goat’s cheese. Serve just warm or at room temperature. If you like a bit of a kick, add a deseeded, sliced red chilli to the squash before roasting.